But surely we can’t stand by as a “monster” annihilates his people in the most heinous of ways? There’s a few problems with that question. One, it makes the assumption that ANY chemical attack in fact took place in Syria. There is scant first hand evidence that this is the case. Two, even if such an attack was carried out there is no direct first hand evidence to connect Assad or his regime with it. Then who else? The faction currently in situ in Douma, Jaish(sword/army) Al Islam were themselves accused of using chemical weapons in Aleppo(yes this Libertarian knows where that is) in April 2016. Is it beyond the realms of reason that they could be responsible for a false flag attack? Four. What’s this “we” business? No one is stopping anyone who feels strongly about fighting Assad’s regime from joining up with one of the many militias doing just that. If they don’t feel fit to enter combat themselves, they can start a fund and pay for weapons and support for other volunteers. Five. Why is this the business of western powers? Arab problem = Arab solution. Our “allies” in the Middle East, Saudi Arabia and the Hashemite Kingdom of Jordan, have between them 334 aircraft with strike capability. The majority of which were purchased in lucrative deals from arms and armaments manufacturers in the UK and US. Let them attack Syria and rescue their Arab Muslim brethren. Or could it be that Saudi is engaged in it’s own dirty war in Yemen and therefore too busy to help out? Jordan’s King Abdullah at least has the testicular fortitude to lead his own troops in battle and has on occasion done so. Unlike our own leaders who feel content to salve their own consciences and indulge their own narcissistic whims by sending other peoples sons and daughters to pay the butcher’s bill. Finally, it’s very easy to step into a conflict, but not quite so easy to step out. As our costly entanglement’s in Iraq and Afghanistan have proved. Are Britain and the US really prepared for the possibility of a war with Russia over a piece of real estate that does not concern us? The last I checked both countries were in massive debt. Does either country think that another war will help alleviate that debt? Was the Conservative party’s policy of “austerity” in the UK implemented merely so that we could spend the money cut from other services on another war? That is simply not on. 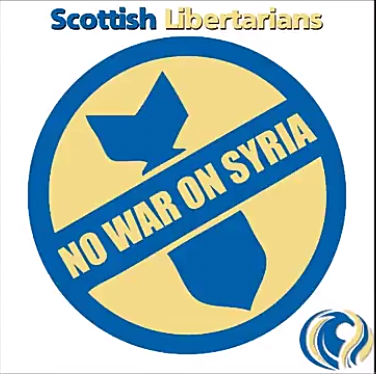 Accordingly, The Scottish Libertarian Party condemn outright the Prime Minister Theresa May’s unilateral and irresponsible decision to attack Syria and put at grave risk the security and financial wellbeing of the United Kingdom and it’s people. The Prime Minister would do well to take care of matters in her own back yard, rather than embroil her country and people in yet another expensive and bloody foreign adventure. 1 Comment on "Statement on Syria"
One, there is scant first hand evidence that any chemical attack took place. Who says? I am watching the news and some conservative MP defending the air strikes said the evidence is clear that chemical weapons were used in an attack by the Bashar Assad regime. How in the name of the wee man can the man on the street make an informed opinion based on that. What am saying is I have not got a clue what is going on or who is culpable and am pretty sure that’s the same as pretty much everybody in the general public. And I am sure its by design, but there in lies the problem.